After nearly 5 years of traveling through space NASA’s Juno spacecraft is just a few dozen hours away from entering orbit around Jupiter, the Solar System’s largest, most massive, and most extreme planet. The Juno spacecraft is a literal vault filled with science instruments and powered by three enormous solar arrays, each 29 feet long by almost 9 feet wide (8.9 x 2.7 meters). Juno is the most distant solar-powered mission ever attempted and its arrays were specially designed to keep its instruments running—and warm—in a region where sunlight is 25 times dimmer than it is at Earth. The “vault”—Juno’s central compartment with about the volume of an SUV’s trunk—is a titanium-lined box designed to shield the spacecraft’s computer systems from Jupiter’s intense radiation and magnetic field. Even with all of its titanium shielding Juno is only designed to complete 37 orbits of Jupiter during its science mission phase before the planet’s radiation environment renders its instruments and CPU inoperable. In order to make sure that the spacecraft remains under control and will pose no contamination risk to any of Jupiter’s moons—namely the ocean-filled Europa—after its 37th orbit Juno will begin a descent towards Jupiter and down into its upper atmosphere, quickly disintegrating upon entry. After its (hopefully!) successful orbit insertion on the evening of July 4 (PDT) Juno will enter a capture orbit phase, gradually moving into position for its 14-day polar orbits and science mission which will begin in October. Once in position, Juno will orbit Jupiter 37 times, soaring low over the planet’s clouds and coming as close as 2,600 miles (4,100 km). During these flybys, Juno will use its instruments to look into and beneath Jupiter’s swirling clouds like no spacecraft has done before. Juno will also take advantage of its polar alignment to study Jupiter’s auroras to learn more about the planet’s origins, structure, atmosphere, and magnetosphere, ultimately helping scientists understand how it and our Solar System—and possibly other planetary systems around other stars—formed. Jupiter’s northern aurora captured in ultraviolet light by the Hubble Space Telescope in 2016. Credit: NASA, ESA, and J. Nichols (University of Leicester). The image above is a portion of a composite of ultraviolet data recently gathered by Hubble in 2016 and and optical-light image acquired in 2014. (Click for the full image.) It shows Jupiter’s powerful auroras encircling its north pole (along with some ghostly “moon footprints”), apparently in high gear just in time for Juno! NASA of course will be throwing its own party for Juno Orbital Insertion (aka JOI) with coverage of the event to be held live from JPL in Pasadena, CA. Starting at 10:30 p.m. EDT (7:30 p.m. PDT / 02:30 UTC July 5) coverage will be aired on NASA TV; you can watch here or by clicking the “NASA TV” link in my page’s menu bar above. Juno will also be obtaining some incredible images of Jupiter over the course of its mission, via its JunoCam instrument. It’s already captured its first views of the giant planet and its famed Galilean moons during approach last week—they will only be getting *much* better from here! Jupiter along with Ganymede, Io, and Europa on June 28, 2016 from 3.85 million miles away (6.2 million km). NASA/JPL-Caltech/SwRI/MSSS. Previously JunoCam got to test its abilities during a close “slingshot” flyby of Earth in October 9, 2013. 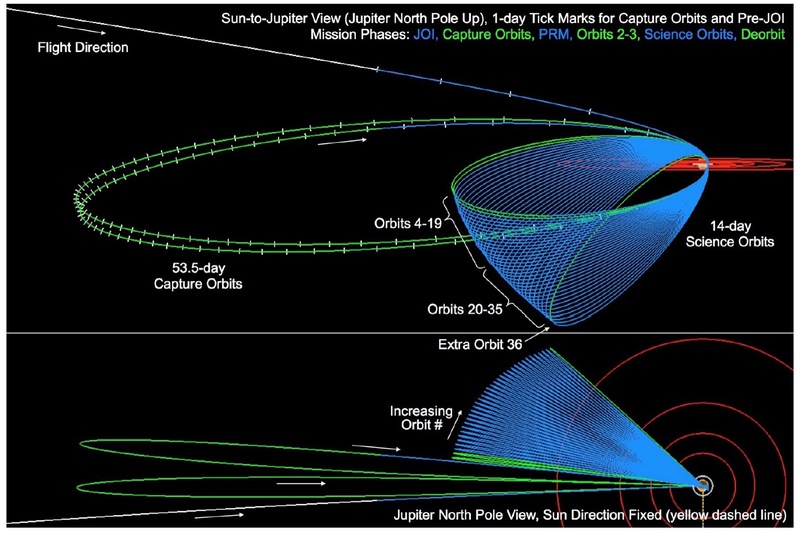 Download an information packet of the entire Juno mission here. Unlike many science acronym-based spacecraft names, Juno is named after the mythological Roman goddess who was the wife of Jupiter (Zeus to the ancient Greeks.) Juno had the ability to see through the clouds that Jupiter used to hide his notoriously prolific infidelities, and likewise the namesake spacecraft has the instruments to peer through the clouds of the planet Jupiter to reveal its deepest secrets. Learn more about Juno and get the latest news on the Southwest Research Institute’s mission site here and from NASA here. I said this on August 5, 2011 and I’ll say it again now: GO JUNO!!! UPDATE JULY 4, 2016: As of 11:54 p.m. EDT / 8:54 p.m. PDT mission operators at NASA JPL have received confirmation that Juno’s engine burns are complete and have lasted the necessary amount of time to establish the desired orbit around Jupiter—Juno is in position and in orbit! Congratulations Juno team!